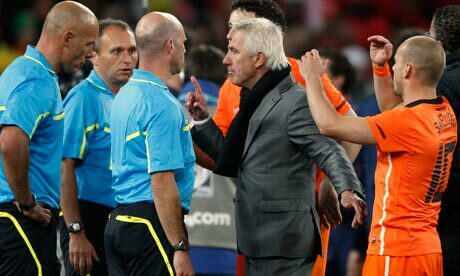 Holland's manager, Bert van Marwijk, second from right, speaks to the referee, Howard Webb, far left. Howard Webb had described his selection to officiate in this final as the ultimate honour, the culmination of a 17-year journey that had begun in the backwaters of the Northern Counties East League. He may now consider last night's privilege akin to having been handed mission impossible. The Yorkshireman departed this arena having flashed a record 14 yellow cards, the two shown to Johnny Heitinga duly becoming red, and with the deafening boos of the defeated Dutch ringing in his ears. The supporters' displeasure was inevitable as he collected his post-match medal. The grumblings of the normally deadpan Bert van Marwijk as he addressed the media will surely have hurt more. Even as the criticisms of a desperate man, they were stinging. "I don't think the referee controlled the match well," said the Holland manager as he digested a first defeat in 26 matches. "Let me be clear about this: the best team won the match. But I read a few things today about how angry Spain were at [Webb's] refereeing in the first match against Switzerland, claiming he had not given two penalties to them. If you viewed the performance [of the referee] today, you'd almost think now that that first match had an influence on this game." That verged on paranoia in the immediate wake of a numbing loss. Webb, in truth, had been given no choice in a contest that bristled from the opening exchange, when Robin van Persie flew in late to clatter Sergio Busquets behind the Spaniard's right knee. The tactic of winning ugly was established early. Thereafter, Webb's greatest achievement was not reducing the Dutch to 10, or even nine, even before the interval. The 38-year-old was helpless here, all attempts to calm down players whipped up into a frenzy by the occasion proving utterly fruitless. Nerves had set in, anxiety gripping the play. From the moment Van Persie became the first name in the book on the quarter-hour mark for fouling Joan Capdevila, Webb was on a hiding to nothing. The striker was the first of five bookings in 13 minutes thereafter, the game being played to a flash of yellow where we had hoped it would be glorious roja or dazzling oranje on show. The previous final record, the six cards shown by the Brazilian official Romualdo Arppi Filho in the 1986 final between Argentina and West Germany, was never likely to stand for long. Not that Webb's decisions were wrong. Carles Puyol's slide on Arjen Robben was blatant, as was Mark van Bommel's clattering of Andrés Iniesta. "The players aren't making this easy for our referee Mr Webb," commented Rio Ferdinand on his Twitter page. Perhaps only Sergio Ramos, penalised for a clip on Dirk Kuyt, could feel aggrieved though Spanish complaints centred rather more on how Van Bommel and, in particular, Nigel de Jong were permitted to remain on the pitch. The Manchester City midfielder's kung-fu kick on Xabi Alonso, whether intentional or not, was scandalous, De Jong planting his boot studs up in his opponent's chest. Van Bommel's crunch on Iniesta 12 minutes from time was just as savage, though went unspotted by referee or assistants. Van Marwijk, conveniently enough, claimed not to have seen either incident clearly either. "I'm on the bench and I haven't seen any replays," he said. "I'd have to look at them, but the way I saw it from the bench was very different. There were fouls from both sides, and quite a few from the Spanish. It's not our style to play 'ugly' or commit horrible fouls. It's not our kind of football. It was a World Cup final and people were tense. Anyway, I think the Spaniards also committed terrible fouls." The flurry of Spanish cards came late, and for dissent or time wasting. The only red was Heitinga's, penalised first for a late tackle on David Villa and then, in extra-time, for pulling back Iniesta. Van Marwijk claimed Webb should have dismissed Puyol for a professional foul when he tugged back Robben as he tore into the area though, by then, the players sensed anarchy. The scenes on the final whistle, with the incensed Van Bommel, Wesley Sneijder and Joris Mathijsen crowding around the officials, were ugly even in the context of a World Cup final lost. Webb may wonder about the honour of such occasions now. This had felt untameable well before the end and he will depart South Africa, undeservedly, on a sour note. Last time around, back at Euro 2008, it was the Polish fans who had hounded him away from the championships incensed that his audacity to award a legitimate penalty in the group game with Austria. As he retreated with abuse stinging his pride, he might wonder whether all this is worth it.